Back in May of 2008, I started this blog. In the beginning I think I had three readers. My husband, my brother Michael, and my friend Mara. Mara is a co-op preschool friend and we have two major things in common. She also has two boys who are about the same age as my boys and she is vegetarian. She has been an enthusiastic reader from the start and I am happy to have been able to share so many recipes with a friend. When our little group last got together, Mara brought a salad that she had spotted in Vegetarian Times. I know we all have eaten our share of fall salads that star pears and goat cheese, but I have to tell you that I thought this salad was extraordinary. All of us at the table went crazy over it and I kept insisting to Mara that she give me the recipe. She told me she was flattered to be giving me a recipe (awww) but I think I will be permanently in her debt for passing this one along. 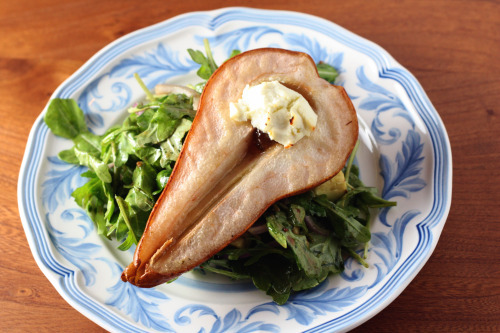 These pear halves get a dollop of fig jam in their hollowed out core and then a round of goat cheese. Olive oil is drizzled over the top and into a 375º oven they go. The pears bake long enough to warm through and soften up a bit and to let the cheese start to brown. Meanwhile, arugula and slices of red onion get tossed with a mustard-y dressing that also stars fig jam. Mara put walnuts and blue cheese in her salad (as the recipe instructs) but I was out of blue cheese so just opted to add avocado instead. I really liked it both ways so feel free to add what you like. I served the pears warm from the oven over the greens which wilted them a bit. Both Randy and I loved the balance of warm and cool but you can always let your pears cool a bit more. This is a dinner party worthy salad that is easy enough for any night. Thank you Mara! I made this just for two of us and I bet if I had made enough for four, we would have eaten it all. Preheat over to 375ºF. Place pear halves cut-side up on a baking sheet. Spoon 1 tsp. jam in center of each pear half. Top with goat cheese rounds, and lightly drizzle with oil. Bake pears 30 minutes, or until cheese begins to brown. Whisk together remaining 1 tablespoon fig jam, lemon juice, and mustard in bowl. Add a good pinch of salt and a few grinds of pepper. Whisk in 2 tablespoons olive oil. Taste and adjust seasoning as necessary. Place arugula, onion, and avocado in a mixing bowl. Very lightly drizzle on dressing and toss to coat. Divide among salad plates and top each with a pear half. Drizzle with a bit more dressing to taste. 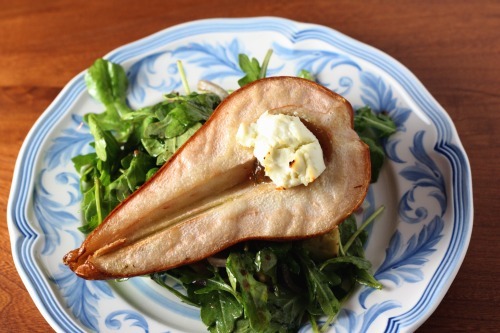 This pear salad sounds lovely, by the way. Anything with goat cheese has me at hello. What a beautiful presentation! I usually end up slicing my pears and scattering cheese over top, but that’s gotten old. This (along with roasting the pear!) will shake things up. Mmmmmmm, that sounds tasty. I have never tried fig jam, but I instinctively know it would be good with pear and goats cheese. I bet it would be great on a cheese board too. What a fantastic salad! I’m also thinking I’d like the warm pear with fig jam and goat cheese for dessert. I receive my VT, last week, and since then I’ve made this salad 3 times. I love it. It’s delicious and quick to make. Next time I have guests over this will be serve as an appetizer. I love the giant pear in the middle. I think I will add this to our menu this weekend. Thanks Dana. what a gorgeous looking pear! i actually have this recipe tore out and in a folder of inspiration ideas, enjoyed being reminded of it by your pretty picture. I made this salad the first day I received the recipe, which was actually last night. I loved it and I think I will make it again tonight. Thanks! This sounds so good that I want to go out and buy the ingredients right now! Delicious and beautiful too! This salad looks sensational. It has so many things I love (pears! goat cheese! fig jam!!!!) and I can’t wait to try it. That is a lovely salad… You are right that it is perfect for fall! I plan to make this recipe soon… But in the meantime, I used the dressing with a chopped salad version – fresh figs, goat cheese, candied pecans – and it was a big hit. Just moved up to top of my go-to dressing list!